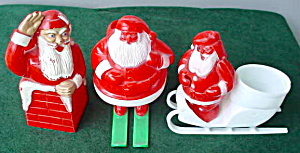 Lot consisting our (3) old Plastic Santas. Include Santa on Skates, Santa on Sled and Santa on Chimney. All in very good condition. Santa on Sled looks like he was holding something in his hand at one time. Would make a nice addition to your Early Christmas or Santa collection. Buyer to pay shipping.